Hello, sir! Here are few ideas of mine, I hope you'll like them. I think you shouldn't change Hawkeye in website name since that is software name. Also i noticed that HawkeyeLive is currently already registered. It was a strong contender also. Hi! Thank you for your feedback. :) I've made few more variations. Please check entry 65. Hi, I agree Hawkeye must remain in the name. HawkeyeLive is good, not quite right but it's definitely better than hawkeye Online. 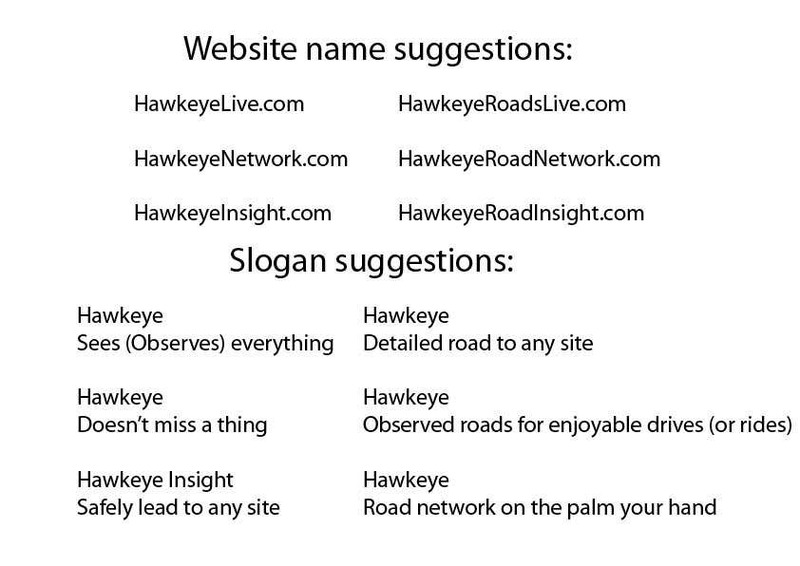 Hawkeye Insight is pretty cool, i like the idea of a single word like that. I also like 'Road network on the palm of your hand', i don't think it will work but its the kind of thing i'm looking for.